This photo was taken on June 4, 2013 at 11:16 AM. The location was at Fairview, Virginia at a special place that I like to call "The Pond Beyond." The "Take It!" was a part of what I will call a photo shoot on a sunny day when everything about the location seemed to be showing at their very best. One of the best parts about this shot was that it was able to capture the movement of the branches in this weeping willow as they moved in the breeze. It is a peaceful portrait of what I believe is a happy tree. The After Take: Each person that I have shown this to, seems to be moved by this photo. I too am taken in with its sway. There are moments when nature has its gentle way with us. When we are lucky enough to have it happen, it leaves its image with us, a ready reference in the library of life. Looks like such a great day. 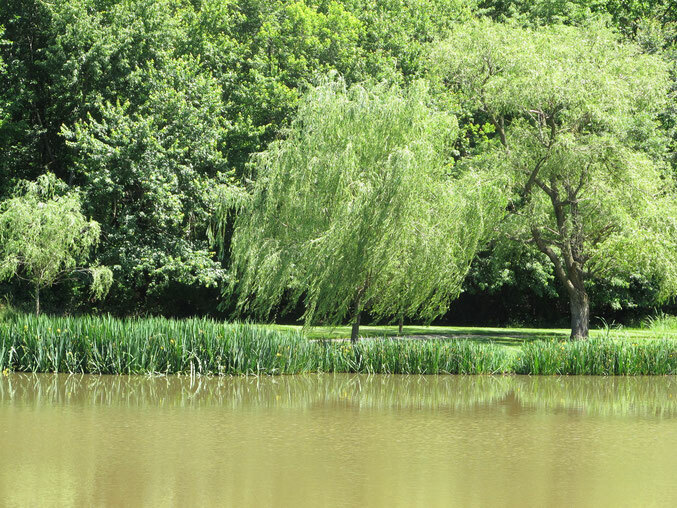 This pond seems to have many scenic areas to it and you continue to capture them. Just need a tree house and a rope with a tire on it. Any child's dream! This is why I have chosen this online handle. The beauty in nature is nothing short of amazing. This looks very similar to where my daughter was married. Half a country away but still it has a similar look to it. Very lush! A great day. Many thanks for all of your kind comments. I am so glad this pond and its surroundings seems to offer inspiration to all of us. It is truly a treasure and keeps on giving wonderful images for us to share. Be ready for more. Thanks again and very best regards to everyone.